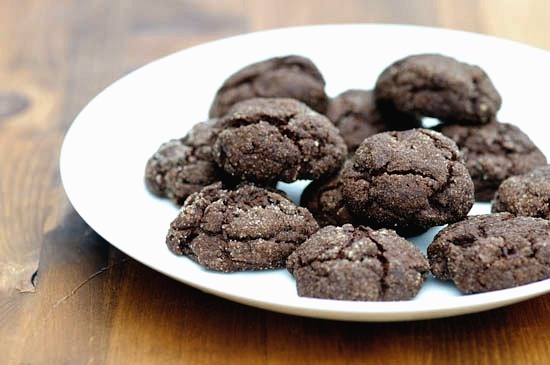 Last year around the holidays, I discovered and fell hard for Cooks Illustrated‘s recipe for chewy chocolate cookies. I adored their lovely soft texture and how they contain the perfect amount of melted chocolate chunks. And the sparkling crunchiness of the sugar in which they were rolled before baking? I loved that, too. I recently played with the recipe a bit so they’d be a little healthier (I used natural Lyle’s golden syrup instead of the dark corn syrup), as well as mostly organic and 100% fair-trade. I also added the hint of mint, which makes them perfect for the holiday season. I was very pleased with how they turned out, and gave tins of them away as gifts last week. If you need a hostess gift for New Year’s Eve, I think these will be perfect; I think they’ll also go over well as a sweet snack for house guests over the New Year’s holiday weekend. If you don’t like mint or don’t have access to a high quality, fair-trade bar of mint-flavored dark chocolate, feel free to use a plain chopped dark chocolate bar instead. The folks at Cooks Illustrated recommend Callebaut Intense Dark; your favorite semi-sweet chocolate bar will also work. Make sure not to chop the chocolate too much or it will completely melt into the cookies while baking- 1/2 inch chunks are the best. I know some of you have already embarked on your post-holidays “detox” or whatever you want to call the attempt to institute healthy eating habits after a month or so of decadence. 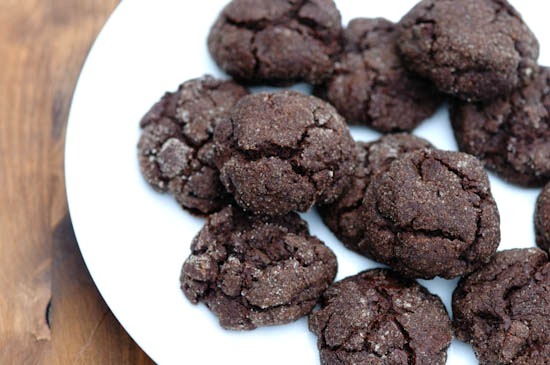 If that’s the case, then don’t make these chocolate mint cookies now. Bookmark the recipe for later, and rest assured that I’ll be back with a much more virtuous (yet equally delicious) recipe tomorrow. 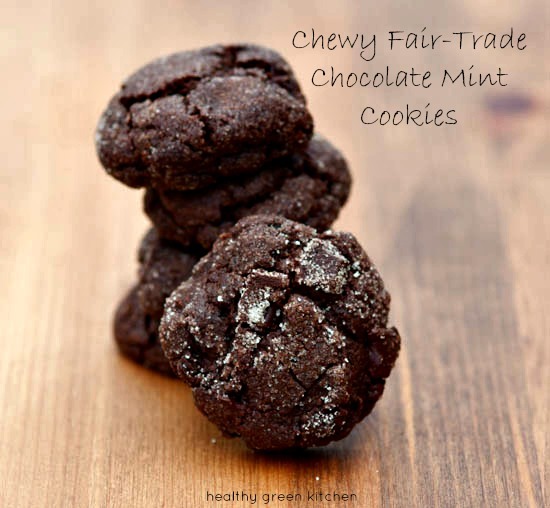 If, however, you have no interest in depriving yourself until sometime next week, then, well, here you go…I suggest pampering yourself with my chocolate mint body scrub, then having one of these cookies. Because I’m clearly obsessed with everything chocolate mint. And because you only live once. 1. Preheat oven to 375 degrees F. Line two large baking sheets with parchment paper (or use silicone baking mats/Silpats). Pour the 1/2 cup sugar into a bowl and set aside (note that you probably won't use it all). 2. Whisk flour, cocoa powder and baking soda together in a small bowl. Set aside. 3. In another small bowl whisk together the golden syrup, egg white and vanilla. Set aside. 4. In an electric mixer fitted with the paddle, beat butter with dark brown sugar and the additional 1/3 cup of organic sugar together until light and fluffy (about 2 minutes). Add the golden syrup mixture and beat until combined (about 1 minute). Add the flour mixture and chopped chocolate and mix until just combined (30 seconds-1 minute), making sure all of the flour is incorporated into the dough. 5. Chill dough for at least 30 minutes, or as long as overnight. Roll into approximately 16 equal sized balls with your hands, then roll these in sugar to coat. 6. Place on prepared baking sheets, approximately 2 inches apart. Bake 10-11 minutes, watching that the bottoms do not burn. 7. The cookies are done when they have "cracked" and still look wet/underdone between the cracks..they will finish baking out of the oven. 8. Allow the cookies to cool for a minute or two on the cookie sheets, then transfer to cool fully on a wire rack. Adapted from the recipe for Chewy Chocolate Cookies in Cook’s Illustrated Jan/Feb 2009, Issue 96. This post is linked to the Secret Recipe Club Cookie Party. I love chocolate and mint. I usually make a chocolate mint cookie for the holidays, but didn’t this year. I’m going to remember these for next time! I adore minty holiday treats. The mint evokes a frosty winter, yet sweet and warming at the same time. Thanks for sharing such a delightful cookie recipe. oh wow! I love this idea of the mint- looks great! These look fabulous… I am a fan of the chocolate/mint combination! Love the changes you made to the recipe! We haven’t got mint chocolate here in Venezuela but if I put peppermint essence which I brought back from the UK instead of the vanilla, do you think that would work and is 1 tspn too much. We DO have wonderful dark chocolate though!